Spey surgery in a dog. 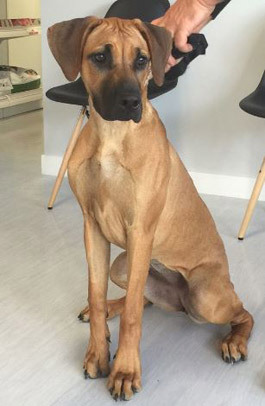 Do you remember the dog Marlee – the Rhodesian Ridgeback who visited Ellerslie vet clinic a few months ago for her first vaccination, now she is visiting us for dog-desexing. Marlee has recently been at Ellerslie Vets for a spay surgery. Desexing is one of the most commonly performed surgeries in veterinary practices and almost every vet clinic will perform several spay operations on cats and dogs every month. Because of this, every vet will perform literally thousands of spaying operations over the course of their working lives. Providing that the dog is in good health and the aftercare protocols are followed at home only rarely complications arise. However, spaying is still an abdominal surgery and “common” is a relative term. Post-surgical problems like infections, loose stitches, abscesses, herniation or even constipation can arise and it is very important to speak immediately to your vet for advice when problems are noticed. In general spaying helps prevent uterine infections and breast tumors, which are malignant (or cancerous) in about 50 percent of dogs and about 90 percent of cats. Neutering your male furry friend prevents testicular cancer and prostate problems. Not talking about behavioral benefits and the control of homeless pets. It is a myth that spaying/neutering will cause your companion to become overweight. Your pet will remain fit & trim as long as you monitor the food intake and provide exercise. And spaying/neutering will not fix all behavioral problems a pet might have. Meanwhile Marlee is back to her loving family and has been back to full speed in no time.